I use my iPad mostly in landscape orientation with a keyboard, and this app only is in portrait mode, so it’s sideways. C’mon developers, do it right an make it so the app rotates. Doesn’t work at all. Should call it Silent Box. There should be more sounds, especially more of the lightly inappropriate ones. For the money, I’m a bit disappointed. Awesome fun app. Has excerpts from the movie Office Space! That’s I have to say about it. I use it at school so i would love to be able to delete some of the inappropriate ones or more easily move them to different screens. Can you put this in a future update??? My husband and I just about peed laughing playing these sounds during the very serious "The Bachelor" finale. I'm 49 and he's 59 by the way. Not planning on growing up, like, ever. Need to be able to search and create favorites. I really like the sounds in the app but not having the ability to share is a killer!!! I love the app and the sounds. Get this app! 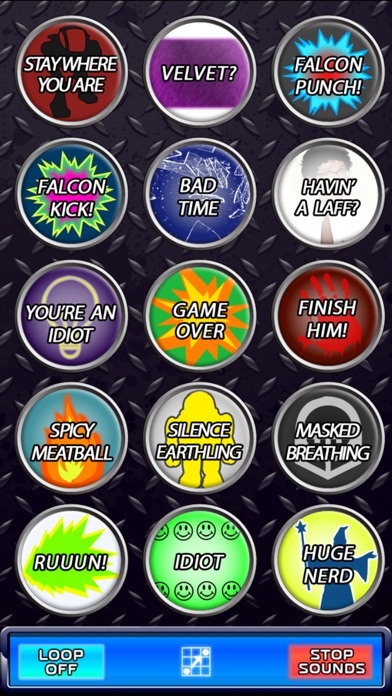 good selection of sound effects, and funny movie quotes. Some real gems too, which are so obscure, I'm amazed they included them. I love how they can be reorganized so I can have my favorite ones ready to go. Nice I love this app I give 10 stars if they have. Delete or give the user the option of deleting due to language. 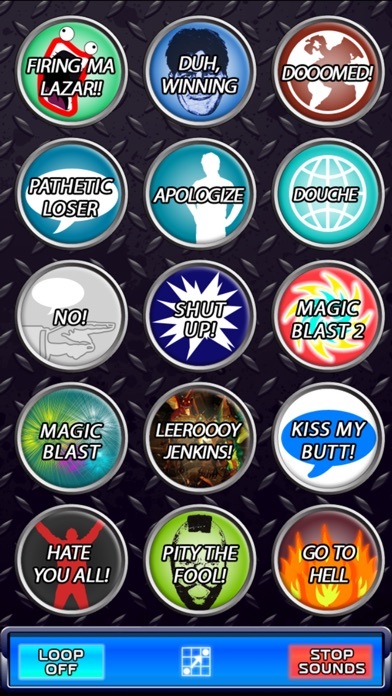 This app has a lot of great sound effects that I love to play for comedic effect at random times, and it brings back some memories from movies and shows we all know and love. My only complaint is that there are a few sounds that I'd want are missing, and it's hard to sort and get to the sound effects I want to play. All in all, a fun app! 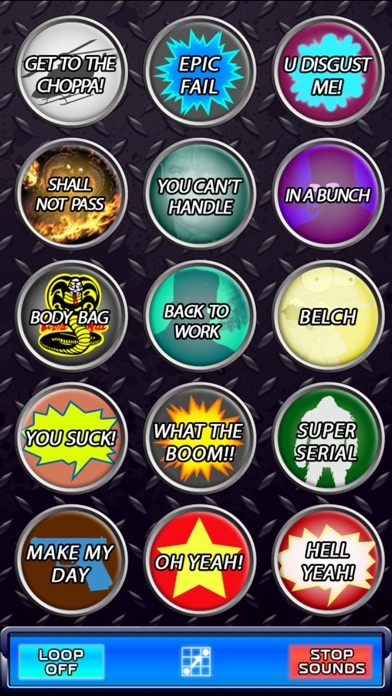 Pretty good app really need one that says MORON though. Would be much more complete with that last one and like others have said either a folder or way to organize them to access them easier would really help. Great App l ! Get it ! Using this has changed the human race! Great stuffage! They should make it easier to assign your sounds in order. It would be awesome if you could just favorite it and have it go to one of several blank pages. Otherwise, this app is AWESOME!! Too cool and TONS of fun!!!! Great app, it would be better if you could change the size of the buttons to fit more on the screen. And if had categories to choose from and customize. Love it! 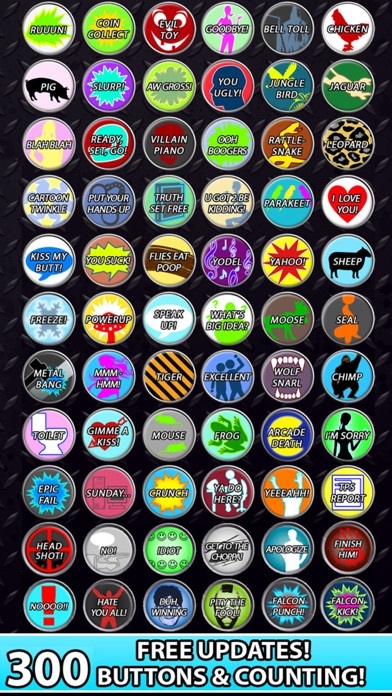 I am an instructor and use some of these sound effects during my classes. I would really appreciate it if a few more sound-bytes that would be fun and appropriate for use in a classroom would be added. Great job with what you have! Lots of fun & lots of variety. Have had a lot of good times esp around other people who aren't aware this app was available. First off, thank you for updating the app! And now for the bad. The sounds work but the buttons and background only fill half of the screen on an iPhone 6 Plus. There is a lot of empty space on the screen. I like this app because I can argue with my children without saying it and can wake them up up for school without having to repeat my self 100 times! It would be nice if you could make it so that it only played one sound at a time. I do like the app and I use it for my podcast and it says 300 sounds but there’s only 285! The last page was deleted and I use it to close my show! What happened to the last page? !